Rufus Norris’ terrific debut feature, Broken (2012), is about the rites of passage of Skunk (Eloise Lawrence), an 11-year girl growing up in a London cul-de-sac with her father Archie (Tim Roth) and brother Jed (Bill Milner). Three things trouble Skunk: her mother’s desertion, her diabetes and their unpredictable neighbours. Sweet, curious and naive, Skunk tries to get on with everyone including next door’s slow-witted son, Rick (Robert Emms), who evidently has learning difficulties. Rick is terrorised by the unruly Oswald girls who live opposite. Their mother has recently died and their father, Bob, (Rory Kinnear) has a violent streak. When Bob is falsely led to believe that Rick has raped his eldest daughter, he brutally assaults him, witnessed by a horrified Skunk. This terrifying act of violence leaves Rick dangerously unstable. Meanwhile, Skunk enjoys a tentative first love with a local lad, Dillon (George Sargeant) and starts secondary school. She endures a traumatic few weeks where she’s mercilessly bullied by the youngest Oswald daughter, Sunrise (Martha Bryant), but is rescued by Mike (Cillian Murphy) – her teacher and former boyfriend of family au pair Kasia (Zana Marjanovic). Events move apace as Rick is sectioned, middle Oswald girl Saskia (Faye Daveney) becomes pregnant, and Archie begins a relationship with Kasia. Adapted from Daniel Clay’s 2008 novel, Broken was originally inspired by Harper Lee’s To Kill a Mockingbird, although it strikes out in different directions. Some reviews have suggested that Mark O’Rowe’s script is cluttered, at times melodramatic, or bears too many traumatic incidents for one film, but this is easily forgiven when there is much else to admire. Norris and O’Rowe are well served by Rob Hardy’s superb cinematography and Victoria Boydell’s editing. They play with notions of a linear narrative, tracking back and forth between scenes, so that sometimes we see the end result (usually related to an act of violence) before we learn the cause and the sequence of events leading up to it. Broken is a compelling drama that delivers on numerous levels; funny and intensely moving, it has you rooting for Skunk from the start. Lawrence’s debut is astonishing. Immensely watchable, with a smile that lights up the screen, she perfectly captures the dynamics of a child attempting to understand a turbulent adult world. Roth also impresses as her loving, solicitor father who tries to keep his family grounded and acts as peacemaker amongst the neighbours. Their relationship is beautifully observed and, rightfully, the film’s emotional heart. 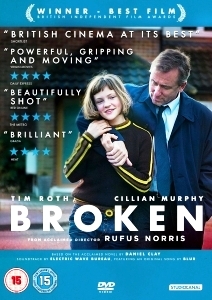 Win a DVD copy of Rufus Norris’ debut film Broken with our latest competition. Follow this link to enter.